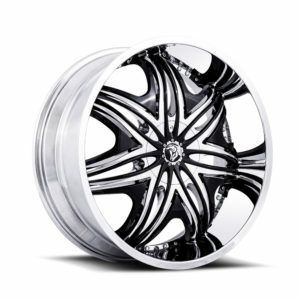 Check out this Bagged RAM on 30″ Chrome Diablo Morpheus wheels without inserts. From the unique paint job with pinstriping to the crazy sound system, you will definitely see and hear it from blocks away. The Diablo Morpheus is a very stylish wheel even without its inserts. When you want a unique looking wheel, the Diablo Morpheus is your best option.